By no means do Amish people take this notion literally. Jam, or one of its cousins, can be had pretty much any day you want it in most Amish homes. You can also find it on store shelves, at least 6 days per week. I picked up the jam above–okay, Strawberry Rhubarb Butter–quite a few yesterdays ago. It was last summer, to be precise, in Nappanee, Indiana. Note the prominent sticker on the lid, leaving no question who’s responsible here. I guess I’ve been following in the spirit of that Lewis Carroll quote, since I haven’t opened it yet. 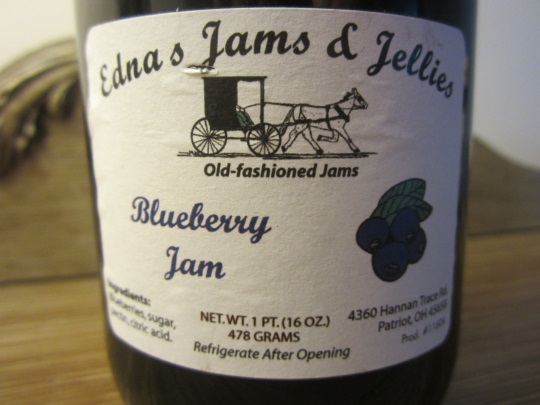 Here’s another jar–Blueberry Jam–also purchased last year, at an Amish variety store in the Gallia County, Ohio settlement (on the hilly West Virginia border, if you’re wondering). I haven’t opened this one either. No, I’m not a jam collector. I’m not aging them to see if they improve with time. I don’t have a great reason other than I put them away and forgot about them. Does Amish-made jam taste better? Only you can answer that question. Is it better for you than the store-bought? Well, Edna’s Blueberry lists four ingredients: Blueberries, sugar, pectin, citric acid. Store-brand Concord Grape, currently on the shelf in this home, admits to six: Concord grape juice, high fructose corn syrup, corn syrup, fruit pectin, citric acid, sodium citrate. If we go by the fewer-ingredients-is-better theory, maybe Edna wins here. That double dose of corn syrup is a little suspect. These are pretty standard flavors, as far as Amish-made–or Amish-marketed–jams and spreads go. Some get a little funky. The “Amish Wedding” label produces a Peach Jalapeno flavor. You can have Amish-made FROG jam (Fig, Raspberry, Orange, Ginger) or the Pecan Strawberry variety sold by one Illinois store. Surely there are more oddballs out there. Which is your favorite Amish jam (or jelly or butter)? If I had to choose, I’d go with classic raspberry. Wish I lived near the Amish so I can answer the question. No doubt,the Amish jams are better. Alas, if I only had a small jar to taste since it’s 2:28 AM! I don’t know as I’d say Amish jams were better than commercial jams as much as most homemade, canned jams/jellies are better. Jam and pickle making have been a “study” of mine for over 20 years…and I’ve got some pretty good recipes and “techniques,” if I do say so myself. I’m not saying Amish jams are inferior in ANY way…just that it’s the homemade part that generally sets the jams apart. and sugar-free. You can buy them at many stores in the Arthur area, but I always like to stop by the farm to get them. I brought to my neighbors a jar of their cherry butter a few years ago and now every time I go to the Arthur area, they want me to bring them back a case. I’ve been to their place Al, and picked up some of their products at a gas station off of I-57 near Arcola. I think it would be a nice home business to have. An apple butter maker I know in Ohio gets to enjoy the aroma of the apples while they are cooking. But like most things maybe that gets old after awhile. My favorite jam is Peach-Apricot. I bought some in Chouteau, Oklahoma, but the store closed or changed hands, and I have not been able to find that combination anywhere else. I hope the name of Traffic Jam is preserved! The owners of Yoder’s Fine Foods of Gambier, Ohio, have an Amish background. They make jams, jellies, and butters, but not Peach-Apricot, yet! My favorite of all the Amish make is apple butter. I love it. But, I guess that’s not a jam, so my favorite of their jams is raspberry. There is an Amish man that comes to the Farmer’s Market and his wife makes the jams. They are from near Waterloo, NY. My favorite Amish Jam/butter is Sunnyside Pastries No Sugar Added Apple Butter. there is always a jar in my fridge. I like it with peanut butter or mixed with Cottage cheese. I haven’t had any of their Jams/butter or Jelly’s yet. I plan to get some this year while in Lancaster, PA. I am sure they will be delicious and so much better than store bought. a few in my “stash”. Enjoy your trip when you go to Lancaster. Margaret, I guess I’ve never been bold enough to try one of these jalapeno jams, even though I like hot peppers in other dishes. They must make a nice partner to the sweet fruits since you see a lot of them. How spicy are they? Try the pepper jams & jellies on top of cream cheese. That’s how we like them at our home. It’s best on crackers or toasted bagels. Jalapeno Jams & jellies usually arent that hot.. when you cook jalapenos, it usually takes some of the heat out of them.. sometimes, all of the heat.. They usually leave more of a subtle warm spicy aftertaste than anything… They’re wonderful & you dont know what you’re missing… Try them! Thanks Kim, something with jalapeno or pepper is going to be my next jam/jelly purchase. 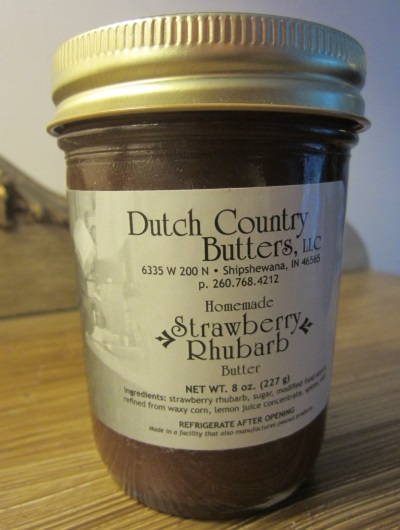 Today I also finally cracked open the strawberry rhubarb butter pictured above. It was excellent. I’m partial to the various butters. Glad to hear you like it! I have enjoyed following your blog the past number of years and must have missed this when it initially posted. That’s my grandma Mandy on the label and the contents were made by her granddaughter – my cousin – Mandy. Cousin Mandy’s business always fascinated me and when they wanted to sell it to family last year we jumped at the chance to buy it from them. We love sharing this part of our Amish heritage (we are now Mennonite). Growing up in an entrepreneurial Amish / Amish Mennonite family I have found your observations realistic and true to my own experience. You are to be commended for your keen insight into a subculture of America. If you ever come to Shipshewana Indiana we would love to share our business with you along with many of our Amish and Mennonite friends and neighbors’ businesses. My favorite flavor is Traffic Jam! It contains peaches, strawberries, cranberries, raspberries, and cherries. Yum, yum! I don’t know how it tastes, but Traffic Jam must have the best name (okay, or FROG jam). We are so lucky to have an Amish family here in Ft. Scott that make wonderful jams & apple butter. It makes great gifts for friends and family in California , who treasure them ! Apple butter is my family’s favorite, hands down! We always pick up half a dozen jars or so when we visit Holmes County. It is a delicious topping for cottage cheese. So many jams, so little time! My favorite is blackberry, and I once had a non-Amish quince JELLY (I know, not the same), which was nice. Strawberry rhubarb is a close second to blackberry. When in the Shipshewana area last year, at the Rise & Roll bakery, I got some type of jalapeno jam for my son-in-law (his preference is “the hotter, the better”), and he enjoyed it. I also got dandelion JELLY (so-so). Now I’m craving some “still-warm-from-the-oven” home made Amish bread to spread the jam on…mmmmmm! My favorite would be the one shown at the top, the Strawberry Rhubarb Butter. I love Rhubard in any shape or form. For those of you that don’t have access to Amish jam’s, go online or then facebook, and look up “Mattie’s jams and Jellies”. She takes mail orders and sends any amount all over. Ordering from her is helping support a single Mom with 2 sweet little girls! best. Also gooseberry. My favorites of anything is orange marmalade and tomato-lemon preserves. I make all my own jams and jellies and trade with friends and relatives to get a nice wide variety. Amish jams get my vote. I do not buy store jams. Favorite flavor? Strawberry rhubarb, although I haven’t tasted one I don’t like. It sounds like your a bit like me on the jams and spreads thing. still had a bit, but luckily it stayed well. I personally LOVE Apple Butter and Strawberry Rhubarb. My mom’s favorite is Pepper Jam…I can’t even bring myself to try that one, and I like spicy things! Apple Butter is awesome regardless of who manufactures it! It goes quite well with anything. Corncob jelly is not bad, tastes like apple and has a pinkish color. Is corncob jelly just a name, or actually made from corncobs? If so, that is a recipe for the resourceful. I’d like to try that one. Figs,Rasberry, Orange, Ginger thus the F.R.O.G. cute eh? Hm Have to go look to make sure I got that right. But it comes in sweet like regular jam and hot to use like pepper jelly-(that one is called Hoppin FROG Jam 🙂 ) I’ve only seen it in Berlin OH so far. Very good! I will be making peach jam tomorrow, my first canning experience since I helped my aunt long long ago. As it turns out, I was by an store today in Amish country that had a whole slough of jams. Tried the FROG — and now I can honestly say that I have found an Amish food that is just ~nasty~ (IMO). Don’t know if it was the ginger in it or what, but reminded me of a strong horseradish taste (which I also don’t care for). But I another new-to-me jam called Christmas Jam, which was a pleasant blend of strawberries and cranberries. Definitely one on my updated list of favorites. And an old fav. is gooseberry. 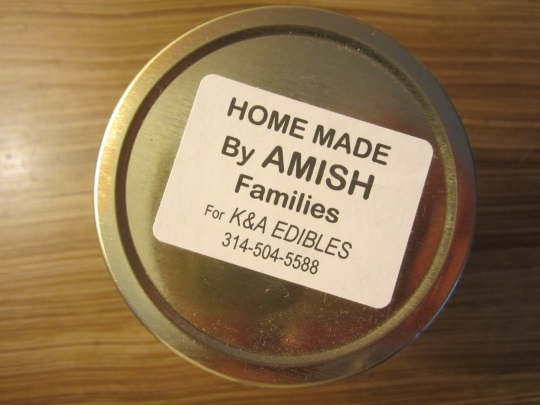 I stock up on a variety of Edna’s jams at the Annapolis Amish market whenever we are able to get there, and I have to say they taste far better than anything I’ve found elsewhere, including fancy designer-type jams and jellies. I think it’s the lack of chemicals in them. One thing I have learned, however, is that if I open a jar, I’d better be prepared to eat it regularly since it does tend to thicken up and even get moldy if you let it sit in the fridge long enough. That’s rarely a problem for me, however. 🙂 I can’t honestly say what my favorite flavor is — it’s whatever one I have open currently! I’ve also tried an assortment of the different butters, and they’re all wonderful. It helps that I love sweets, of course! Are these the same Edna’s that I have above? They must have a wider reach than I’d expect. I bought the jar above from Hershberger Country Store in the Gallia County OH community. Since the label says Patriot, OH, I figured they would mostly sell locally. I paid $3.97 for the jar above. I read this post to my son, Mark, who is Amish. He wanted me to mention that Belle Center has their own jam kitchen. It is called Country Kettle Jams and Jellies. It is owned by Marvin and Dorcas Coblentz and they make the jams right on their property. Mark’s favorite is their Cherry Preserves. He also likes their Seedless Black Raspberry Jam. I’ve been there. I don’t know who many kinds of jams and jellies they make but they make a bunch of them. I really like their peach butter and their pumpkin butter. I’m pretty sure they do mail-order, as well. Amish Jam ??? never had that,,,,was Amish born and raised,and never had that…. Damson Plum Jam not near Amish so purchased from Amazon. Mmmmmmmmmmmm – delicious!!!! Try it!!!!! The Amish make most of their jams & jellies the same way that you & I do.. They buy pectin to make it & use plain white sugar… (I’ve bought it at the same place they were buying it many times) so in that regard.. there isnt any difference in Amish Jam or Jelly & mine… Store-bought VS Me & Amish… You betcha! Nothing tastes as good as homemade.. Anyone who has ever had my apple butter says its the best they’ve EVER eaten.. and we even have an Apple Butter Festival near by that sells it by the cases..
As far as jam that I know was produced by the Amish, my favorite is a Rhubarb jam.. no strawberry included.. Its mighty good. I think Gooseberry might be another that I like.. I never bought any.. just sampled it.. I rarely eat jams or jellies.. even though I love making them. My favorite jam from the Amish is Elderberry and Huckleberry Jam, which I bought in Yoder, Kansas. Delicious! I think my very most favorite jam that I ever did eat was some I made from Dewberries (a trailing blackberry) and Mulberries… YUM! Favorite Amish Jam - which to choose? Which to choose? Last week we visited the Etheridge, TN Amish and I bought some jams and jellies from one of the Amish families. I bought muscadine jelly, apple butter, and persimmon jam. I can’t decide which to choose first! We did stop by Monells Mansion for dinner (with the Hemi Truck Club) and Monells has the best peach preserves. They tasted exactly like the peach preserves my grandmother used to make. So, I bought a jar of them. I think I’m going to start with the muscadine jelly! P.S. Erik, I’ve had the Amish traffic jam in the past and it is very good. Also, I LOVE your site. Thank you Karla! I will keep an eye out for traffic jam next time. Muscadine sounds great too. I’m a fan of the grapes. In our area (western PA) you can find a jam that is called Christmas Jam by the Amish. It is very good ! Do you know the ingredients/flavor Judith? When I get to Lancaster’s Central Market, I always pick up a few jars of jam. A coworker always wants their Crabapple Jelly and I usually get the Tomato Jam. I noticed they have someone else’s name on the jam and I found I don’t like the new batch at all. I’ll still get it next time – hope to get a better batch! Try calling Hershbergers Truck Patch (330-674-6096), or The Ashery Country Store (330-359-5615) or Walnut Creek Cheese (330-852-2888).